Architect: Daniel H. Burnham & Co.; Burnham Graham & Co. The Field Museum of Natural History (commonly abbreviated to FMNH or The Field Museum) is located in Chicago, Illinois, United States. It sits on Lake Shore Drive, next to Lake Michigan, part of a scenic complex known as Museum Campus Chicago. It is one of the largest privately funded museums in America, and has held a long-standing reputation for excellence in educating the public, as well as preservation and research. The dinosaur exhibit "Sue," the largest and most complete Tyrannosaurus rex yet found, continuously attracts the public of all ages, as do its many interactive displays. The Field Museum has contributed to the advancement of museums in a number of ways. Carl Akeley, who served on the museum staff is well known for his development of taxidermy methods used to display animals in dioramas. The research carried out by the Field Museum continues to be made available through publications, and the Museum is involved in the development of The Encyclopedia of Life, a free on-line database that will be open to the public. The Museum's focus on the interdependence of humankind and the natural world is a valuable contribution to understanding how humanity affects the environment. The Field Museum, with its displays that reveal to young people creatures from before humankind walked the earth, ancient cultures that lived very differently from us, to environmental issues that people face in the present day, is an invaluable asset in educating all in how it is possible to love the earth and all her creatures. The Field Museum of Natural History was founded on September 16, 1893, as the Columbian Museum of Chicago in Jackson Park, Chicago. 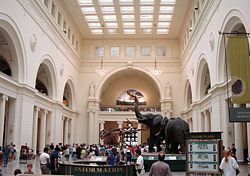 Originally, the museum was designed as a permanent home for the many biological and anthropological specimens exhibited at the Chicago hosted World's Columbian Exposition of 1893, collected and organized by Frederic Ward Putnam. The museum's collection grew rapidly during the next decade, due largely to the contributions of Marshall Field. In 1905, the museum was re-named The Field Museum of Natural History, in honor of its largest benefactor. In 1923, the museum was moved to its current location in Chicago Park. This change transpired during what some have dubbed the "museum period" in American history, in which museums and institutions started to become more prevalent, due in part to the already established trends of Europe. 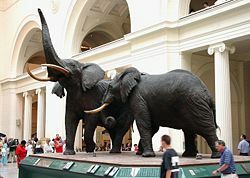 For some years, during the 1950s and 1960s, it was officially known as the "Chicago Natural History Museum" but eventually the still-popular name, "Field Museum," was restored. The museum was added to the National Register of Historic Places on September 5, 1975. Since its creation, the museum has continued to increase its collection and today holds approximately 20 million specimens from around the world. The Field Museum's self-stated first principle is to act as an educational institution. As such, the museum takes a special interest in not only the cultural and biological diversity of the entire Earth, it also places emphasis on the interdependence of nature and humanity. The Museum focuses on the fields of Botany, Geology, Paleontology, and Zoology, but does not treat these disciplines as mutually exclusive; rather, the museum seeks to integrate these subjects to further show the complexity of the world humanity lives in. The museum is conscious of its relationship with the public as well as with the nations and cultures represented in its collection. While it is a private organization, it nonetheless believes that the information and specimens it collects are in fact for the benefit of the public, and as such takes special care in the conservation and preservation of its collection for future generations. This is not limited to preserving artifacts; it also includes compiling and accurately storing a vast database of information which it shares with universities and other archival institutions. The many research projects under the museum's supervision help to further study the current collection for new insights, as well as add to its database. 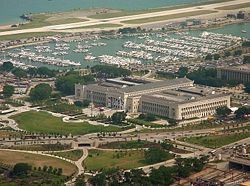 The administration of the museum takes special care to reach out to the immediate community of the greater Chicago area, as well as the public at large, in order to share the knowledge it has collected for over 100 years. The many exhibits of the Field Museum can be divided into those that are permanent and those that are temporary. Permanent exhibits are long-standing presentations of the museum's own collection. However it should be noted that permanent exhibits are often refurbished, altered, or even dismantled. Temporary exhibits are those that are shown for only a specific amount of time, ranging from a few weeks to a year. Often, specimens in temporary exhibits are either borrowed from other areas of the museum's collection or are on loan from other institutions. Whether permanent or temporary, exhibit curators take care to develop exhibits that attract the curiosity of the public. Developing more interactive exhibits in which visitors are invited to engage the material directly has become increasingly popular all over, and the Field Museum is no exception. The Underground Adventure "shrinks" visitors to the size of a penny. They can see what insects and soil look like from that size. School groups and families learn about the soil's bio-diversity and the importance of healthy soil. This exhibit highlights the museum's inter-disciplinary approach, combining elements of geology and zoology. The museum houses thousands of animals, mostly taxidermy specimens. In exhibits such as Nature Walk, Mammals of Asia, Mammals of Africa, and several others, visitors get an up-close look at the diverse habitats of hundreds of animals. The "killer lions," made famous by the movie The Ghost and the Darkness are on display in the Africa exhibit, as is a giant panda shot by Theodore Roosevelt, in the Asian exhibit. A majority of the animal specimens come from famed naturalistic and taxidermist Carl Akeley, who re-invented the way museums display animals: Instead of merely stuffing the animal with straw, Akeley created a near exact skeletal structure of the animal out of wood and wire, and then added a layer of clay to shape on fat and muscle tissue. Once that was done, he would encase the animal's original skin over his creation, thus giving the exhibit a more naturalistic look than if it had been stuffed. Akeley's method became the one employed in museums around the world. Some of his earliest works can be seen at the Field Museum. The Grainger Hall of Gems features a large collection of diamonds and gems from around the world, including a Louis Comfort Tiffany stained glass window. The Hall of Jades focuses on the way that the Chinese used Jade for eight thousand years. The exhibit, "Evolving Planet" (formerly "Life Over Time"), utilizes the Museum's extensive fossil collection, in order to present both the history and the evolution of life on Earth over a span of four billion years, from the first organism to present-day life. Contained within this exhibit are the murals of Charles R. Knight, the first artist to envision dinosaurs in as life-like a manner as was possible in his time (the twenty-foot mural Triceratops vs. Tyrannosaurus is familiar worldwide). Also featured is an expanded dinosaur hall, with dinosaurs from every era, as well as interactive displays that can be more easily updated as paleontologists make new discoveries in the field. Sue, the largest and most complete Tyrannosaurus rex skeleton currently in existence. One of the museum's most famous exhibits opened on May 17, 2000. The Field Museum unveiled Sue, the most complete and best-preserved Tyrannosaurus rex fossil yet discovered. 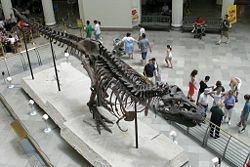 Sue is 42 feet (13 m) long, stands 13 feet (4 m) high at the hips and is 67 million years old. The fossil was named Sue after the paleontologist who found it, Sue Hendrickson. Sue's actual gender is unknown, although because she was named after Hendrickson, she is commonly associated with being a female. Sue is a permanent feature at The Field Museum. Sue's body is located on the main floor in the Stanley Field Hall. Her head was too heavy to be mounted on the rest of the body, so it is located on a second floor balcony, although a replicate head is mounted on the body. Sue and her juvenile counterpart, Jane give Illinois two important Tyrannosaurus rex fossils. The public can view two laboratories in the Museum. 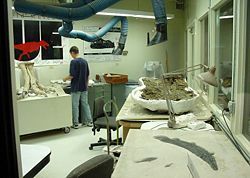 In the McDonald's Fossil Prep Lab, the public can watch as paleontologists prepare real fossils for study. The Regenstein Laboratory is a 1,600-square-foot conservation and collections facility. Visitors can watch as conservators work to preserve and study anthropological specimens from all over the world. The museum has extensive anthropological exhibits. "Inside Ancient Egypt" offers a glimpse into what life was like for ancient Egyptians. Twenty-three human mummies are on display, as well as many mummified animals. The exhibit features a tomb that visitors can enter, complete with 5,000-year-old Egyptian hieroglyphs. A popular feature of the exhibit is the mummy of Unis-Ankh, the son of the Pharaoh Unas. The exhibit is a re-creation of his tomb in a mastaba. The Museum has a Native American exhibit, with totem poles and traditional clothing. Located within the exhibit is the newly reconstructed Pawnee Earth Lodge. Visitors to the lodge learn what life was like for the Pawnee. The Pawnee Earth Lodge has proven to be one of the largest attractions for the Museum, especially for school groups. 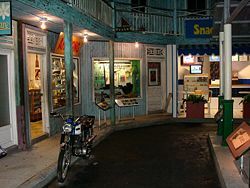 The Northwest Coast portion exhibition, which was redesigned in the 1980s, has been particularly influential in terms of museum exhibition design. Other exhibits include sections on Tibet and China, where visitors can view traditional clothing. 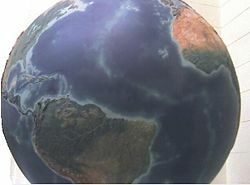 There is also an exhibit on life in Africa, where visitors can learn about the many different cultures on the continent and an exhibit where patrons may "visit" several Pacific Islands. The Museum houses an authentic nineteenth century Māori Meeting House, Ruatepupuke, from Tokomoru Bay, New Zealand. The Field Museum is actively engaged in international research and is a recognized leader in the fields of evolutionary biology, ethnology, and archaeology. While the majority of its staff researchers devote their energies to the area of analyzing and preserving pieces within the collection, the museum does offer competitive grants to independent researchers. The Museum's extensive library comprises more than 250,000 volumes that is available for nearly anyone to use for research (with permission from the library's administration). and it is currently working with other institutions to produce The Encyclopedia of Life, a free on-line database that will be open to the public. The Museum is digitizing portions of its collection, so that other scientists and the public have better access to specimens. In addition, nearly all of the research papers and discoveries made through the museum, or in connection with its collections and funding, is published in its academic series, Fieldiana. The museum's archives of Fieldiana journals goes back to the nineteenth century and are available for purchase on-line. Other work includes a joint effort between Chicago, London, and Baghdad to catalog artifacts located at the three museums that came from Kish, which is a five thousand year old city south of Baghdad. ↑ National Register of Historic Places, National Register Information System. Retrieved July 27, 2016. 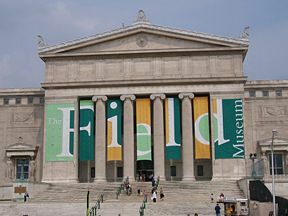 ↑ The Field Museum, An Introduction to the Field Museum. Retrieved August 7, 2007. ↑ The Field Museum, Mission Statement. Retrieved July 27, 2016. ↑ The Field Museum, SUE the T. rex Retrieved July 27, 2016. ↑ The Field Museum, Biodiversity Synthesis Center. Retrieved July 27, 2016. ↑ The Field Museum, Kish Collection. Retrieved July 27, 2016. All links retrieved April 7, 2017. Fieldiana and other museum publications available through a third-party book seller. History of "Field Museum of Natural History"
This page was last modified on 7 April 2017, at 19:53.